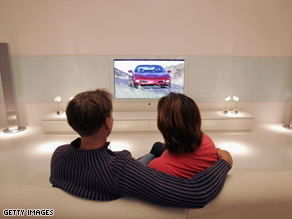 U.S. broadcasters were to begin transmitting their TV signals only in digital format on February 17. Yesterday, Congress showed that it’s quite capable of having its cake and the glass half-empty, too. The mixed metaphor that is our United States House of Representatives approved the delay of the DTV transition to June, paving the way for President Obama to sign it into law. Congress did manage to extend the "hard date" of the transition to June 12, 2009, but in the spirit of something resembling compromise, they left some gaping loopholes in the extension. No, television stations are no longer required to turn off their analog transmissions on February 17. But they can, if they want. In fact, stations can make the transition at any time they wish between now and June 12. This, of course, means that many citizens have gone from a defined drop-dead date for the end of analog television to a nobody-knows date when analog TV goes away. Never let it be said that the United States Congress can't help the average citizen feel more confident and secure. Acting FCC Chairman Michael J. Copps said yesterday that 143 stations have already terminated analog service, and another 60 are planning on terminating service between now and February 17. Additionally, about 61 percent of full-power stations are already operating on digital frequencies. As I said last week, the DTV transition won't disrupt most viewers. Most of us get our television from cable, satellite, the Internet, or already have our HDTVs with converter boxes. There are benefits, of course, to upgrading to DTV and wide-screen televisions. Those of us who had HDTV during the election got to see those spiffy extra side charts CNN displayed on the wide-screen broadcast. And who doesn't like a few extra pie charts on their screen? You can't have too many charts, I say. But there will be disruption for those who aren't tech savvy enough, don't have the money, or haven't been lucky enough to get a coupon from the government for a converter box. Fortunately, those disruptions probably won't all be on the same day, all over the country. But many people won't know when the change-over day will come (thanks to some ambiguity in Congress’ decision), so we'll probably have a few thousand surprises happening on a daily basis between now and June. Ah, well. This, too, we shall survive. I have a DTV and a HD satellite receiver, I have the option right now to watch the digital channels or non-digital channels for the same program, not on all programs but most. I just want to say the digital picture is much clearer for sure, but the signal gets jumbled a lot more often than on the non-digital channels. When that happens, I change the channel to the non-digital channel and the feed is okay with no interruptions. I don't think the bugs are worked out on the digitial signals yet.. I wouldn't be envying people who got a coupon for the box – I've read that the program to furnish these boxes is out of money and that there are tens of thousands coupons waiting to be fulfilled but no money to do it. Another government promise bites the dust. We have known about this transition for years... I have to say I am rather disappointed. What I find to be amazing is that the government expects those people without a job and without a home to fork over $70 for a TV converter box. If they're not one of the lucky ones who got their hands on a coupon for a converter box, or don't have a TV that was purchased in the last 2 years or so, they're simply out of luck. Really? People are having enough trouble putting food on their table. Now they can't even enjoy a simple luxury, like TV? I recognize the cost to TV stations - an estimated $22 million for PBS to keep their analog transmissions going through June. But the loss in viewership could cost them even more. Advertisers tend to bail out when viewership declines. But then again, advertisers might be bailing out anyway. While I do feel bad for people who can't afford to pay for satellite, cable or what not I just have to say that TV is not something that you can't live with out! So why is congress focusing on this when it means nothing to us! Our economy is in shambles and they decide to fool with this stuff instead of trying to work out a deal to get the stimulus package passed! What is up with them!? I they can't even get this right and leave huge gaping loopholes then how in the world can we expect them to get the stimulus right!? There's got to more to this....Last week or so... I heard Rep Maxine Waters from California on C-Span promoting the TV Coupon & Broadband Pork Portion of the job bill. Her point was that it would give jobs/training to the Black community in her neighborhood. The last I heard Waters on C-Span was in 2004 at the Fannie & Freddie hearing defending Mr. Raines... it was good...Barney Franks and those members of the Black caucus looked like idiots defending those two companies. Man...you can't trust any of these guys. I am a little disappointed to hear of this delay. On the other hand, this is the least of our worries. I can tell you from experience that the benefits of switching from Analog to Digital are huge. Your picture and sound come in crystal clear! No more ghosts or static! For most tense and purpose, you can say that DTV channels come in absolutely perfect, or not at all. I believe when this transition is complete, all of us will begin to see very rapid changes to television and the way it is broadcast. Also, this is to say nothing of the large benefits the transition has to state and local governments. Shutting down Analog broadcasting frees up the airwaves of many frequencies that can be used by emergency and law enforcement entities.